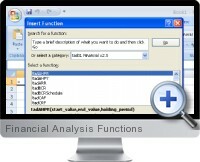 Excel Financial Analysis Functions (tadXL) is an add-in for Excel 2007 and later that adds over 100 useful and accurate cell functions designed specifically for financial analysis solutions. The financial functions are available with Excel like any other built in function allowing to quickly and easily make calculations required for financial analysis project and work. Detailed and targeted functions are categorized by investment and analysis purpose with descriptions provided for each function. Interest rate functions for bond and fixed interest investment securities with support for single rate and schedules of both periodic and non-periodic nature. Present and future value calculation through various DCF valuation techniques and assumptions including separate functions for capital costs and CAPM components. Factor analysis functions provide calculations for sensitivities such as capital recovery, compound, present worth, sinking and growing annuity for present and future values. Financial ratios such as cost/benefit ratio as together with key performance indicators (KPI) such as internal rates of return (IRR), payback period and profitability metrics allows fast building of financial analysis dashboards. Bond calculations with solving for yield to maturity with sensitivities on duration and convexity allow fast analysis of debt and interest rate investment assets.